It never ceases to amaze me how some people think they will get away with doing wrong things. By "doing wrong", in this case, I mean counterfeiting dollar bills and spending furiously. 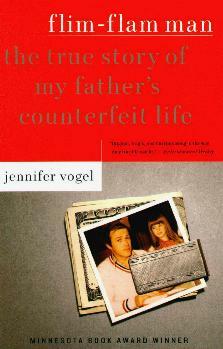 This is just one of the things author Jennifer Vogel's father got up to. An absent father, and a mother who drank, Jennifer and her two siblings rarely got to see their father except on holidays, if he wasn't in jail. Long after her mother straightened out her life and her father seemingly had his own business, were the children able to see their father for what he really was. Ms. Vogel writes in an engaging style that'll keep you turning the pages. She's not filled with hatred for her father as one might expect, and she relates her story of their growing up poor and struggling to keep some semblance of a family life and her leaving home to go and stay with her dad - an eye-opener. She also talks about his arrest and his fleeing the long arm of the law, believing he'd get away with his crime. It's sad how someone can be so delusional about their capabilities and life in general. She also shares her father's letters from prison and her personal achievement in going to college and leaving behind a potentially dangerous life. Conclusion - Very honest and an amazing story of getting through things that come our way.